American author Marston (Women of the Middle East: Tradition and Change, 2003, etc.) 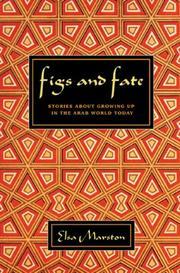 offers five intimate tales about life in Middle East countries from the perspective of the young. The characters here are drawn from different classes of an Arab society mired in stasis, conservatism, and patriarchy. In “In Line,” set in Egypt, the privileged new girl in town, Rania, from a family of government workers who hold themselves above the peasants, longs to befriend Fayza, the smartest student in school but from a lower class. Allowed once to lunch at Fayza’s farm, Rania is enchanted by the farm chores and by the meal eaten on the floor, yet her parents are horrified by the mud on her clothes and Rania’s infraction of skating in public with Fayza’s older brother. In “The Hand of Fatima,” a Syrian maid working in Lebanon arranges for her father to join her, then faces an arranged marriage only slightly sweetened by the gold charm her father is able to buy her as bribe or dowry. “Faces” describes an adolescent Damascan boy’s awkward but well-meaning attempt to make dinner for his beleaguered mother, dumped by his father for another woman, while “Santa Claus in Baghdad” follows the impoverishing effects of the Gulf War on a family who can no longer afford even the basic necessities—such as the bounty of drugstore items Uncle Omar brings from America. “The Plan” is a sweet story from a Palestinian refugee camp about a young boy’s attempt to hook up his unemployed peddler brother with his lovely new art teacher. After each vignette, Marston presents an Author’s Note detailing social and political factors that may have been touched on—like the fact that after divorces in Islamic countries, the father traditionally takes the children, or that gold jewelry for women is a form of insurance when marriage fails. With annotations that make it especially useful for educational purposes and young readers, a welcome and human glimpse into an often misunderstood culture.